It has not been a banner year for the tomatoes. The romas are producing heavy yields of heavy, dense-meated fruit.. but only three plants survived through flowering. The Black Krims are covered with green tomatoes, all of them developing cracks around their tops ...and if we can just get a few more good, hot days and the persimmons and cornucopias live up to the promise of crazy quantities of hard, green ones they gave now...I may have to revise my 'rotten year' assessment. And until then, enjoy the special glow that (almost) only children have - aren't they awfully pretty?!?! 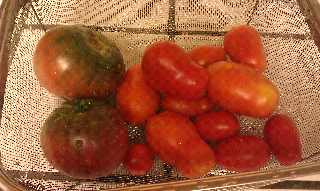 my romas didn't do well at all this year. None of my tomatoes did...we've kinda neglected our garden this summer, but even the tomatoes usually do well under neglectful circumstances! My Romas did great, the heirlooms, not so much EXCEPT for the yelllow pears. Each one of them was like tomato candy.